The cult of John Deere is strong in the Midlands for understandable reasons. For more than 180 years, this company name has been synonymous with simplifying and streamlining the labors of agriculture, and its trademark green and yellow colors have become symbols of quality and durability. 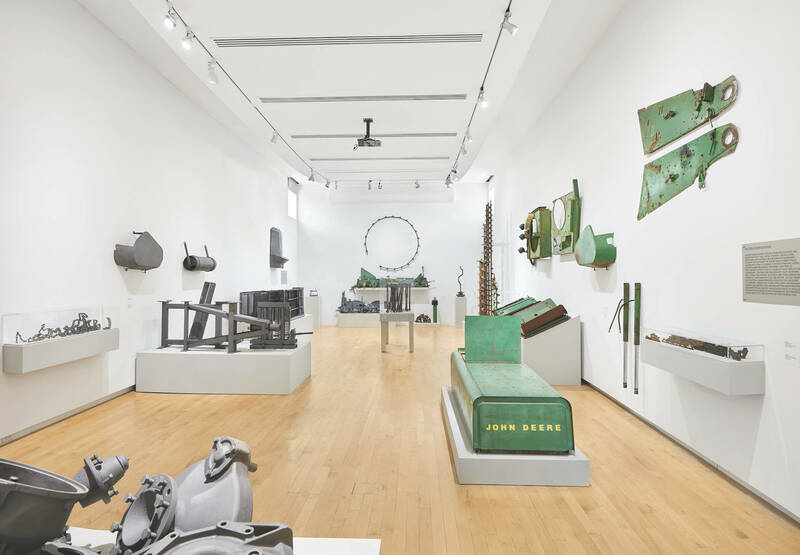 For Indiana born, New York-based artist David Brooks, a single piece of John Deere equipment embodies the multifaceted elements of an entire ecosystem. In his installation for the Bemis Center, which opens June 1, Thursday until 9 p.m., he will lay out every part of a disassembled used 1976 Deere 3000 combine harvester. Some components are recognizable while others are sorted by shape or finish rather than function. Some are painted or rusty, while Brooks has brass-plated or gold powder-coated others and organized them in vitrines in the manner of museum display. In this way, the harvester is reinvented into a kind of classification system reflecting the structures of scientific taxonomy. The result is a kind of altered landscape, involving an intersection of technology and nature. David Brooks: Continuous Service Altered Daily opens June 1 and runs through August 26 at the Bemis Center for Contemporary Arts at 724 S. 12th Street in the Old Market. Open hours are Wednesday-Saturday from 11am-5pm and admission is free. For more information, call 402/341-7130 or visit www.bemiscenter.org.